TO GO – CLICK HERE FOR THE 2018 PROGRAM AND BOOKINGS! Every year they get better! On this 42nd Anniversary of the Australian Academy of Tai Chi (established 1976), our Seminar will feature the latest in Tai Chi and Qi Gong research, scientific applications, training techniques, and body-mind cultivation. There will be workshops and practice sessions on meditation, breathing, Tai Chi, Qi Gong, and massage. This will be an opportunity to learn new internal energy skills, healing techniques, Chinese health nutrition, acupressure and Qi massage. Also, hear about the latest medical applications of Tai Chi skills including Balance and Falls Prevention, Cancer rehabilitation, healing, Alzheimer’s, biofeedback & Neuroplasticity. Jing (Essence): Train the physical body including bones, muscles, sinews and tendons. Qi (breath, life force): Mobilise blood circulation and Qi energy to nourish internal organs. Shen (mind-spirit): Refine Qi energy to nourish the brain and rejuvenate lymphatic & immune systems. ALL HEALTH ENTHUSIATS SHOULD ATTEND • TAI CHI, YOGA, PILATES, DANCERS, PERSONAL TRAINERS, PHYSIOTHERAPISTS, EXERCISE PHYSIOLOGISTS, ALLIED HEALTH WORKERS, DOCTORS, MARTIAL ARTISTS AND BEGINNERS OF ALL LEVELS MOST WELCOME. Immerse yourself in Tai Chi & Qi Gong away from the hustle and bustle of work and daily routine, it is an opportunity to unwind and recharge your physical & mental health. Enjoy a weekend practising with like-minded people, and learning the latest new techniques from experts. If you can’t join us for the full weekend, please choose the sessions that suit you. Founder of the Australian Academy of Tai Chi (1976), International Tai Chi Judge (Diploma – China Wu Shu Federation), Author of 25 Books & DVDs, created Hospital Rehabilitation Training programs and Presenter at Medical conferences. 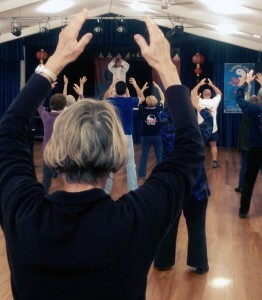 Presenter at the two International Tai Chi Symposiums in USA, Geriatric Medicine and Falls Prevention Conferences in Australia & New Zealand, conducts Traditional Academy Tai Chi Classes, and trains Traditional & Applied Tai Chi Instructors and ‘non-expert’ group leaders for Applied Tai Chi. Has been specialising in Falls Prevention, Healthy ageing, PTSD and Chronic Pain Management. Bachelor of Health Science & Current 3rd Year of Traditional Chinese Medicine – UTS. A Health Science graduate and currently researching and studying Traditional Chinese Medicine & Western Health science. Trained by Grandmaster Gary Khor, advanced training at Wu Dang Mountain in China by Taoist Priests in Taoist Meditation, Qi Gong & Tai Chi. The optional outdoor “Tai Chi in the Park” session in beautiful New Farm Park by the river is in an optimal environment to cultivate your body-mind-spirit. The session is conducted there by Master Rod every Saturday morning from 8-9am for only $5. For the seminar Grandmaster Khor will also make a special appearance and no doubt give you some excellent advice on practice.